You may not have thought of doing it before, but combining ground beef and turkey into one burger patty creates a nice texture and flavor combination. The beef keeps the burger juicy, and the turkey adds a healthier meat to the mix while reducing the amount the cooked burger will shrink on the grill. 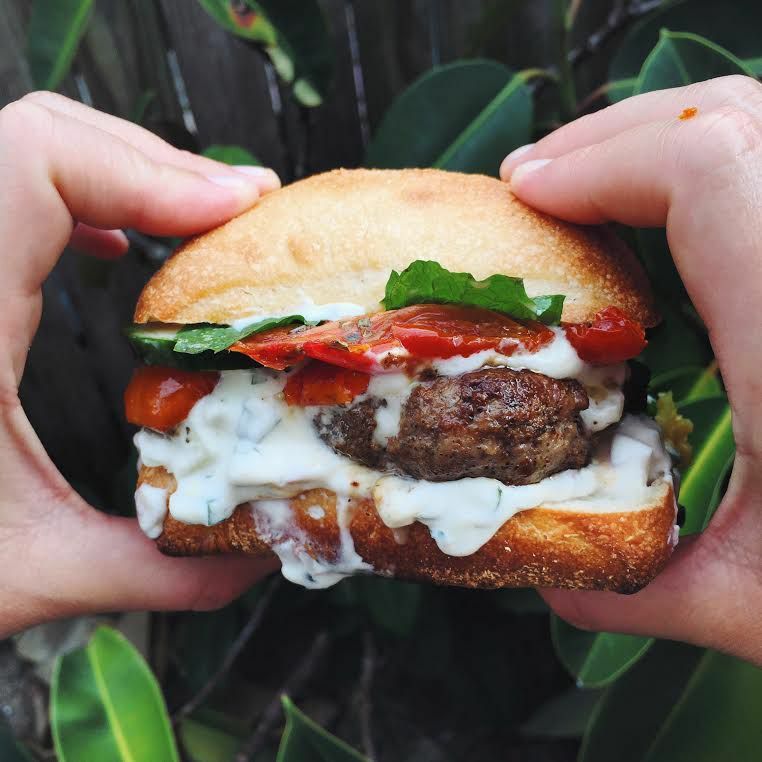 These reasons alone take the typical burger up a notch, but then adding fresh basil to the mix brings an unexpectedly delicious freshness to this popular cookout dish. Sweet onion, Parmesan cheese, and garlic add a nice depth of flavor while dressing the burger with roasted red peppers brings a bit of color to the finished sandwich. Combine egg, onion, basil, Parmesan cheese, garlic, pepper, salt, and ketchup (if using) in a large mixing bowl. Add ground turkey and ground beef to the bowl, mixing well. Shape into eight 3/4-inch thick patties. Preheat grill to high heat. Place burgers on the grill and reduce heat to medium. Cook burgers for 10 to 14 minutes turning once halfway through. Remove burgers from grill and serve topped with sliced roasted red peppers on toasted hamburger buns. Serve with condiments on the side. Do not overmix: When combining the burger ingredients, make sure not to overmix; if the raw meat is handled too much you will end up with a dense and heavy burger. Give the mixture time: Allow the mixture to sit in the refrigerator so the flavors to meld together. Making patties: Wet your hands before forming the patties, so the meat does not stick to them. To avoid the burger from becoming too rounded on top, use your thumb to create an indentation in the top of the patty before placing on the grill. Some chefs even recommend freezing the patties before grilling to help them keep their shape and increase the moisture. Prep in advance: If you are making the patties ahead of time, place them in layers separated by wax paper, on a baking sheet covered with plastic wrap, or in a zip-top bag. The sky is the limit on condiments: Instead of the quintessential condiments—ketchup, mustard, and mayo—serve these burgers with a special sauce. Whip up a garlic aioli, use store-bought chipotle mayonnaise, combine pesto with mayo (a great complement to the basil inside the burger), or even use a tomato chutney. Healthier options: You can easily make these burgers even healthier by swapping out regular hamburger buns for whole wheat or multigrain—or make them open-top and serve only on the bottom bun. Add plenty of vegetables as toppings including fresh spinach leaves, tomatoes, avocado, red onion, and pickles.